KILLER: short pimples with astounding disruptive effect KILLER is an astonishing new development among offensive pimple-out rubbers. It is a combination of short and medium pimpled rubbers that merges the best characteristics from both rubber types. 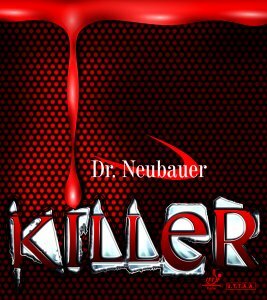 KILLER provides very good attacking possibilities and is thus an outstanding choice for a modern pimple-out game close to the table. The rubber fulfills all necessary requirements for fast counter-attacking and strong hitting. The decisive factor is the disruptive effect obtained. The rubber is more disruptive than most other short pimple rubbers and produces a very low bounce. Control is excellent and enables the player to "feel" the ball at all times. All in all KILLER is hardly sensitive at all to oncoming rotation. With thin sponge (1.5mm) the rubber is able to produce drop shots and chop-blocking against topspin. The rubber can also be used for a modern chopping and attacking game with great control. This makes KILLER a "must-have" for most short and halflong pimple players!